This is our 2nd year participating in this awesome ministry, and I want to start off my post with this beautiful video from Samaritan’s Purse. Every time I watch it, it brings tears to my face, happy ones! Feeling so blessed that we’re able to put smiles on the faces of these children. As I mentioned in my first post about Operation Christmas Child. 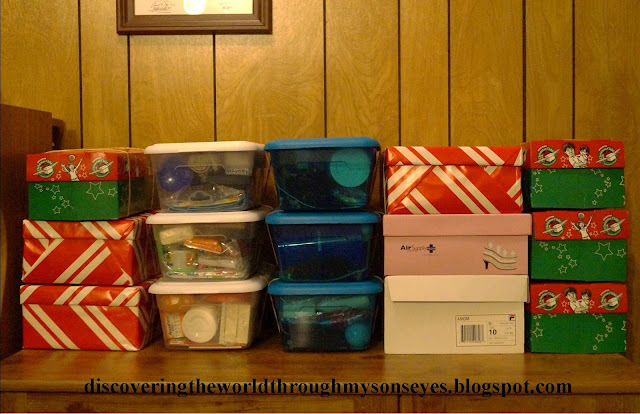 I have been collecting freebies (from hotels, conferences and festivals), and purchasing items on sales, clearance, and with coupons for this year’s shoe boxes. Samaritan’s Purse has this awesome form that children can personalize and add to the shoe boxes. So, we included this About Me form that my son colored himself. I added his picture, filled in the blanks for him and in the back I included our family picture. Since we have 15 boxes I had him color 2 sheets, and then I made 15 color copies to include in the shoe boxes. You can download this form here. 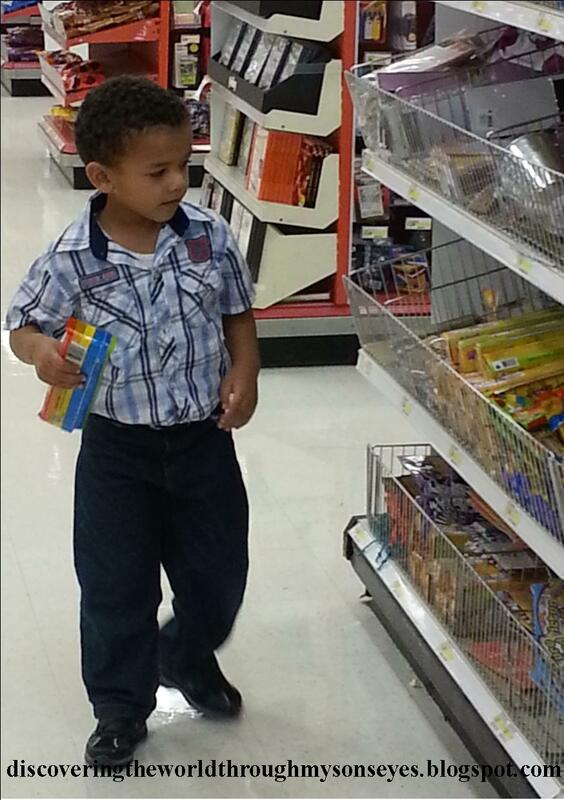 He starts looking around, and picks the toys, some candy, markers, and some other things. 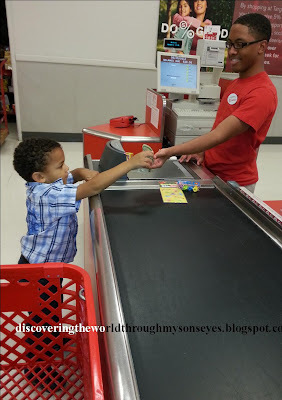 Off we go to the cashier, and he wants to pay all by himself so I give him the money. Sweet! 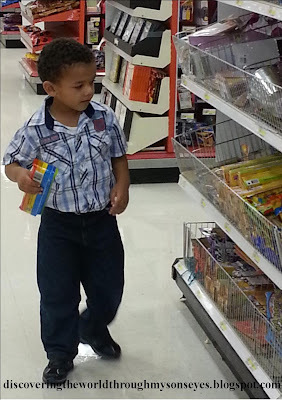 This past weekend little one was ready to pack the shoe boxes with his Daddy. 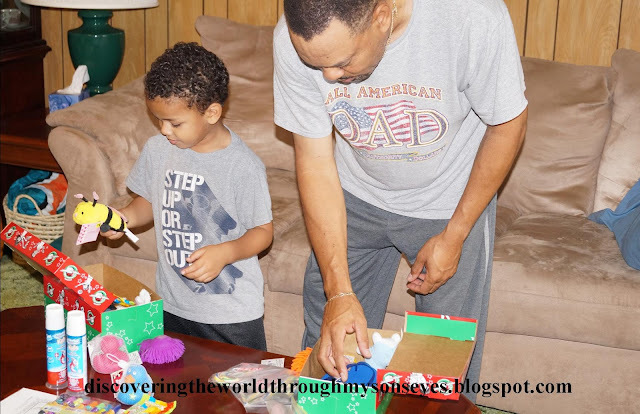 He packed shoe boxes for one boy and one girl ages 2-4. He was so proud and excited! Though, we still need to decorate and wrap some of the shoe boxes before the drop-off date, but at least they are all finished. After months of planning, preparing, and praying we have finally tallied up our shoe boxes: 15 in total! What a blessing! It has been a joy seeing these empty shoe boxes come together. 15 shoe boxes, 15 lives for ever changed! The shoe boxes and the contents of what we packed can be found here. Make a difference in a child’s life, pack a shoe box! It’s still not too late to participate in Operation Christmas Child! If you have an empty shoe box, soap, toothbrush, toothpaste, hard candy, and some small toys you can probably pack one! For more ideas and suggestions on how to pack a shoe box go here. National Collection Week is during November. You can check for the drop-off locations here. Simple beaded friendship bracelets for OCC recipients. A $10 challenge for the OCC shoe box. Crafts made by children for children for the OCC shoe box. Thank you letter sent to us from a recipient! 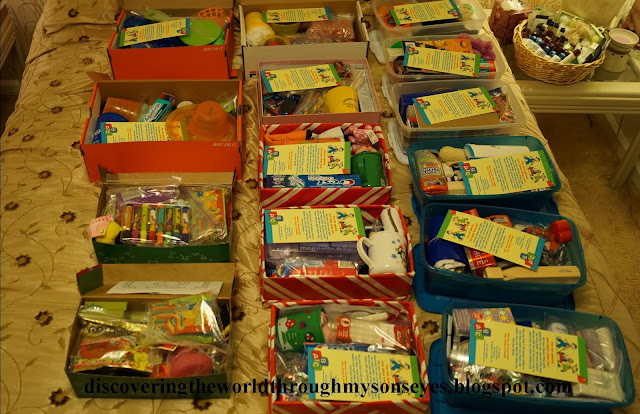 Follow Frances’s board Operation Christmas Child & Shoe Box Ideas on Pinterest. Please share, like or comment! Love hearing what you have to say! I love how you have been collecting things all year long. I need to start doing this too. 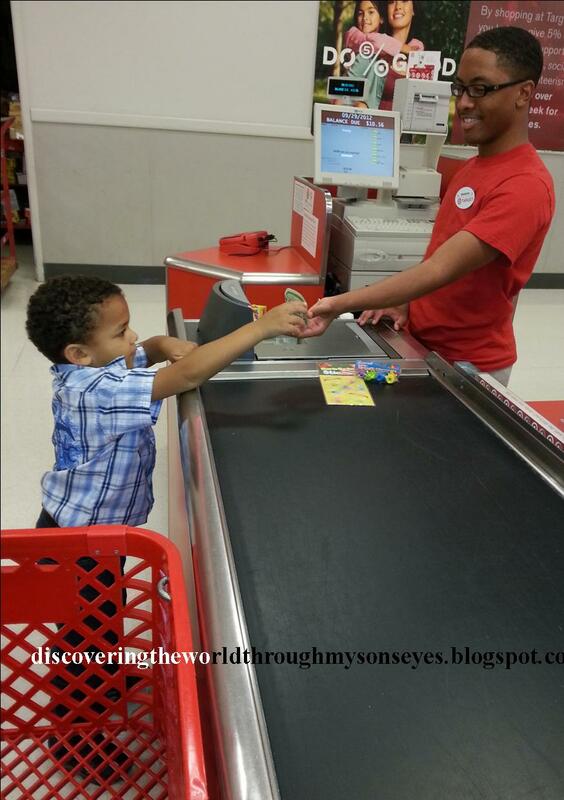 Your son has a sweet heart – and so cute! I love the cards you included in each box! This is truly an inspirational post. Wonderful. Pinning it. I was introduced to OCC by a lady from work and was immediately hooked! Have been participating every since then and have tried to increase the # of boxes we make each year. I, too, shop all year long to help with the cost and LOVE sales. This year (2015) my church craft group ladies are going to participate – our goal is 25 – and we are going to make a lot of the things that we'll include. That's why I have to get them going now, in April, to be sure to have all our projects done in time. This is a wonderful ministry! Love the cards you had made. Hi there, thank you so much for posting about OCC. I love your card idea, just what I've been looking for. Can you tell me if there is a template you used? Hi SandyK! Go to Vista Print, and click under ALL PRODUCTS – MARKETING MATERIALS – RACK CARDS. Under search designs type in the ID: 434011 and voila! There you have the card that you can customize.